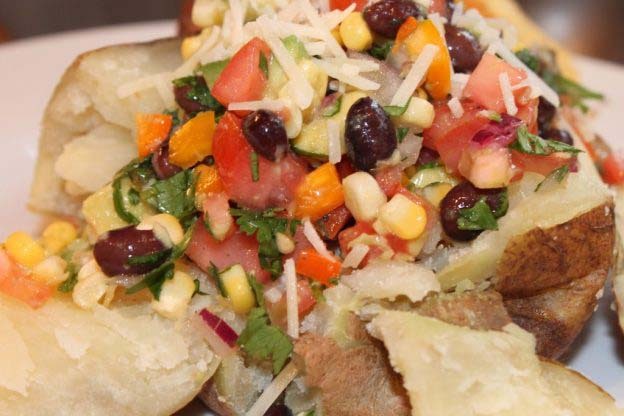 This 15-minute Mexican potato hits the spot. I love adding fresh corn and chopped avocado to my fast and easy pico de gallo recipe here. It’s like a taste of spring inside a soft potato, either slow cooked, baked or microwaved. They’re especially yummy when you make your potatoes restaurant style rubbed with olive oil and kosher salt. Cali pico de gallo looks and tastes fresh. Chop a little pickled jalepeno for a kick and get ready for your tongue to tango. This condiment is awesome on chips, eggs, burgers, chicken or anything else your heart desires. So go ahead and serve it every day. What will you serve your cali pico de gallo with? This entry was posted in 15 Minute Meals, Vegetables + Fruits on 17.05.2013 by admin.